LAWRENCE — Once upon a time, a Jurassic spider fossil was an extremely rare find. The first was discovered in Russia and described in 1984 — another was found three years later. But that remained the totality of the fossil record. Then, in the 21st century, farmers in the area of Daohugou, China — just inside Inner Mongolia — began turning up Jurassic-period arachnids on a hillside. Because of the proliferation of these Chinese discoveries, these days a few hundred specimens are known to science. 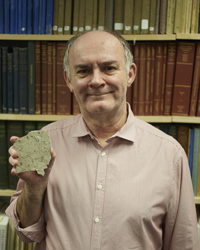 “Village farmers dig pits to extract the fossils, which are mainly insects and the occasional spider or other animal, and experts from the university in Beijing travel there, usually during the New Year holiday, and sort through the finds,” said Paul Selden, the Gulf-Hedberg Distinguished Professor of Invertebrate Paleontology with the Department of Geology at the University of Kansas. Today, Selden is part of a team that recently described the largest-known fossil spider ever unearthed, publishing their findings in the latest issue of the peer-reviewed journal Naturwissenschaften - The Science of Nature. This specimen's body length is 1.65 centimeters, and its first leg length is 5.82 centimeters. The giant fossil spider is considered to be the male version of a female spider found a short time ago in the same locality, called Nephila jurassica. But because some of its physical characteristics are different from the Nephila genus, the latest discovery has spawned an entirely new scientific name. “Because the male shows features that are not consistent with the placement of the species in Nephila or, indeed, the family Nephilidae, the species was given a new genus name and a new family erected to accommodate the new genus,” said Selden, who also serves as the Paleontological Institute’s director at KU’s Biodiversity Institute. As with most fossil spiders, the features needed to precisely place the species among spider families were not sufficiently preserved. Scientists must have an exhaustive look at foot claws, hairs and genital organs. As luck would have it, the volcanic ash beds at Daohugou are exceptional for preserving such fine details. Selden said that one of the most interesting aspects of this study is how it relates to work being done in molecular systematics on living spiders. The KU researcher said the discovery tells scientists that the abundant insect life in this area during the Middle Jurassic was preyed upon, as today, by large, web-dwelling spiders. Importantly, he said the find helps inform mankind about its own future on the planet. “First, it is an amazing spider,” Selden said. “It’s the largest fossil spider — and great to have both male and female. Second, research into the anatomy reveals details of how it lived and interacted with its insect prey. These give clues to what the climate was like at the time, and we can then track the fate of these ecosystems as they evolved through time and changing environments. Understanding the processes involved helps us to predict how manmade changes might affect the Earth’s climates and biodiversity." Selden collaborated with Professor Dong Ren of at Capital Normal University, with whom he has worked since the early 2000s.